Upcoming is a paid feature and unavailable on our free plan. Tasks can live in many different boxes. As a solution for keeping track of them, Upcoming is a sidebar that unifies tasks across all boxes into a single view, sorted by due date. You can access Upcoming from the Gmail sidebar while viewing an email, box, or pipeline. We suggest appropriate actions based on keywords in the text of the task. The actions are enriched with data from contacts also in the box. 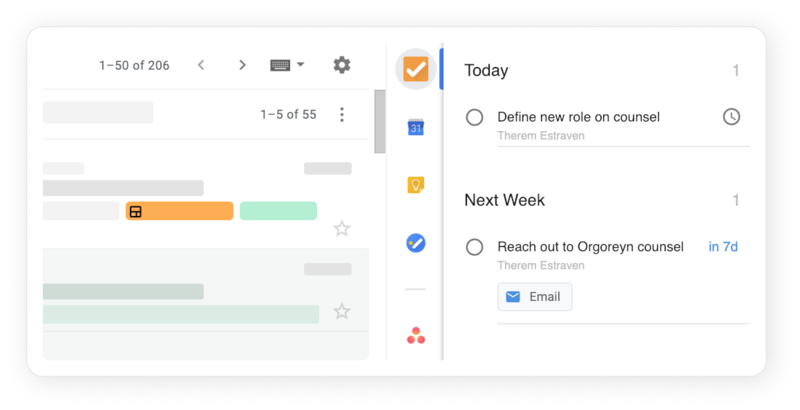 Schedule – including "schedule" creates a prompt for Event that, when opened, will create a new Google Calendar event with the contact automatically added as a guest. Using a keyword like Reach out or Follow up will create prompts for all options available: call, email, and schedule (based on what contact information is available in Streak).